Join writer, poet and artist Khairani Barokka to translate Debra Yatim, known as the ‘Fairy Godmother’ of Indonesian feminist poetry. In January Barokka introduced the PTC workshop to Debra Yatim’s work translating the poem Notes after Watching HBO in a Hotel Room and we are delighted to invite her back for another session. Yatim is an activist as well as a poet. Her work tackles a range of issues from climate change to the gender disparities in Indonesian culture. Debra Yatim was born in Aceh in 1954, and currently lives in Jakarta. She is an activist, journalist, columnist, filmmaker, and founder of more than three NGOs in Indonesia. Yatim has published four poetry collections. She writes a column for a women’s magazine, and is currently working on a cycle of one-woman plays on polygamy, and a new poetry collection on climate change. Yatim is Acehnese-Manadonese, and studied at the Academy of Publicists in Jakarta and Australia’s RMIT. She has worked as a journalist for various Australian and Indonesian media outlets, including The Jakarta Post. 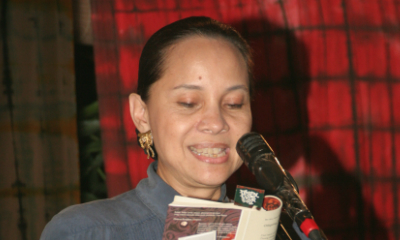 Khairani Barokka is a writer, poet and artist. Published and working internationally, she is the writer/performer/producer of Eve and Mary Are Having Coffee, co-editor of HEAT: A Southeast Asian Urban Anthology (Buku Fixi, 2016), Stairs and Whispers: D/deaf and Disabled Poets Write Back (Nine Arches, 2017), writer-illustrator of Indigenous Species (Tilted Axis, 2016), and author of Rope (Nine Arches, 2017). Among her honours, she was an NYU Tisch Departmental Fellow for her masters, has received six residencies, and was recognised by UNFPA as an Indonesian Young Leader Driving Social Change.